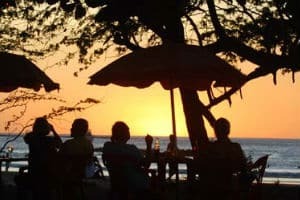 The El Vaquero is Tamarindo’s local favorite beach hangout and open daily until 12am. 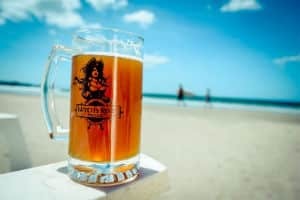 Keep an eye on the waves while eating lunch and dinner, enjoying some cold beers from our on-site microbrewery Volcano Brewing Company. Listen to live music every Saturday and Sunday afternoon while letting the kids run free at our family-friendly restaurant. You might just decide you found your new favorite beach spot in Tamarindo. You can’t any closer to the beach and the surf. Watch the some of the world’s most beautiful sunsets or sit under the stars at night while digging your toes in the sand. Find ample parking in the adjoining beach parking lot. This is where you want to be. Feast on classic BBQ, jalapeño poppers, gourmet burgers, or something for the kids while you sip a cold drink and enjoy the view. Try the famous IPA, brewed right here in our on-site microbrewery Volcano Brewing Company. The El Vaquero is a perfect venue for Tamarindo weddings, large groups, corporate retreats, beach parties, surf contests, and other private events. Let us organize everything and bring your special event to life. 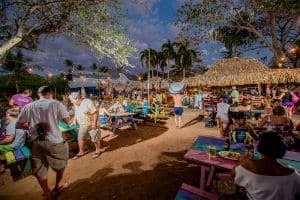 The El Vaquero is Tamarindo’s best beach venue for large groups, beach parties, weddings, community events and more.